A cold front that moved into West Central Texas late Wednesday continues to cool temperatures for the Concho Valley and the Big Country. SAN ANGELO, Texas — The spring-like preview we got to enjoy this last week has come to an end. In the wake of Wednesday night's cold front, skies have cleared and sunshine Thursday will be followed by breezy east/northeast winds at 15-20 mph. 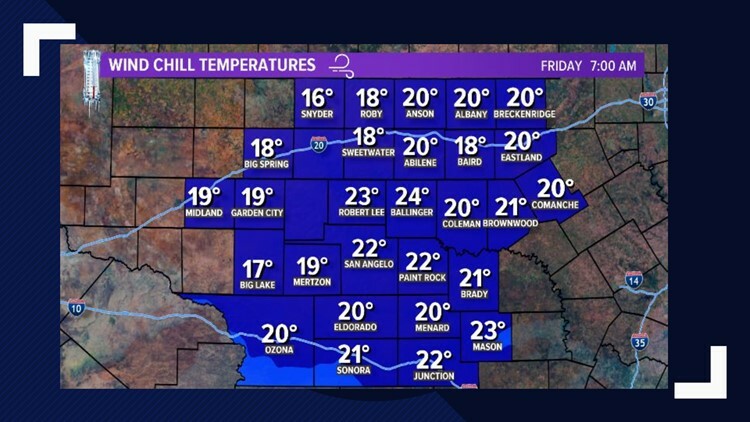 Temperatures will hang around 25 degrees with wind chill values between 15-25 degrees. The last time we fell into the 20s was on Jan. 29, when the mercury fell to 20 degrees. Is it atypical for temperatures to fluctuate so much this time of year? No. In fact, across West Texas we see more cloud cover than any other month. Cloud cover plays a major role in our day-to-day weather. Additional cloud cover during the day limits peak daytime heating. Meanwhile, a lack of cloud cover overnight increases radiational cooling. This allows temperatures to free-fall by the following morning. As of today, the Climate Prediction Center (CPC) gives us a 40-50 percent probability of being warmer than average for the next six-to-10 days. Please note, that doesn't mean our temperatures will be that much warmer, rather, it's a probability, i.e. not magnitude.